The high energy Xstrahl 300 enables the ultimate in superficial and orthovoltage techniques. The Xstrahl 300 is the most powerful and versatile system in the Xstrahl range. As well as treating non-melanoma skin cancers such as squamous cell carcinoma and basal cell carcinoma along with various dermatological conditions, the higher energy range mean that many conditions such as Kaposi’s sarcoma or benign conditions can be treated, such as degenerative, inflammatory and hypertrophic disorders. 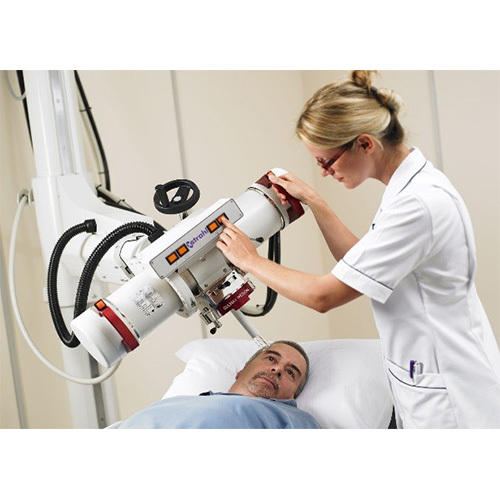 The Xstrahl 300 is also suitable for palliative work, such as the treatment of boney metastases and mesothelioma chest drain sites. • Available as a floor or ceiling mounted system, the Xstrahl 300 is easily installed alongside other equipment and is to adaptable where space is restricted. • Despite the ability for deeper penetration , the Xstrahl 300 is still highly maneuverable, making it easy to treat patients in a position that is safe and comfortable for them. 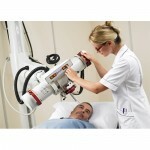 The range of movement in the treatment arm enables smooth adjustment and easy set up for each treatment field. • Full dosimetry control, applicator and filter recognition are available as standard. • Concerto software, Xstrahl’s clinical interface, provides an intuitive workflow for treatments and creates a unique and detailed clinical record for each patient, including treatment images. • The physics interface, Fisica, allows for custom configuration based on individual requirements, in addition to allowing calibration and system maintenance. • The advanced software provides a clinical and physics interface enabling the operator to accurately define patient demographics and treatment parameteres in addition to delivering controlled clinical radiation exposures.